For the last twenty years, Paul Bélanger's poetry has been acclaimed for its emotionally charged vocabulary and philosophical elegance. In Meridian Line, the Québécois poet gives us a cartographer's log of an inner landscape. Bélanger's poems blend a deeply personal voice with fluid, open-ended lines that track the movement of consciousness against the backdrop of an elemental world: "a dirt road / lost on a swath of grey sky." The result, thanks to Judith Cowan's brilliant translation, is meditative, mysterious, and startling. 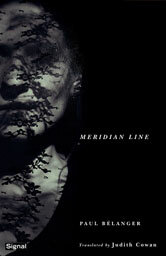 Paul Belanger, poet and editor, has been nominated for the Governor General's Award for Poetry on three occasions, most recently for the French edition of Meridian Line [Origine des méridiens]. He teaches creative writing at the University of Quebec and is the publisher of les Éditions du Noroît.He lives in Montreal, Quebec. 72 pp 8.5" x 5"